It’s been almost twelve months since I reviewed my professional network, so it was timely to look at it again. Once again I’ve used Mark McNeilly’s article Ask These Questions About Your Professional Network Before It’s Too Late to guide my review. I also used Twitter Analytics and the free network visualisation tools TweepsMap to look at my Twitter network and socilab to look at my LinkedIn network. In this time my Twitter network has grown substantially, with an increase in followers from 45 to 615, and I am now following 450 people. I have been looking for a Twitter analytics tools that will help me to look at who I FOLLOW, rather than my followers. I haven’t yet found a tool that does summary level data aggregation on this. Knowing about who follows me and what people find valuable in what I share is useful. However, I also need to know about those I have selected to learn from and seek to create possibilities with – the people I follow. So, by default I’ve looked at the analytics about my followers (approximately 2/3 of whom i follow) to consider this question, along with scrolling through my Following list. My Twitter network has grown largely as a consequence of my Personal Knowledge Management and professional development activities, which use a number of online tools and communities plus face-to-face conferences and real-world work activities. As such, there are a lot of people in this part of my network from the Learning & Development profession, plus others who have an interest in social learning and communities. Geographically, my international network is predominantly in Australia, USA and UK as shown on the TweepsMap below. Given Australia’s business ties with Asia this is an area where I would like to grow my network. In Australia my network is concentrated in Sydney; I would like to grow my network in other areas, especially Melbourne and Brisbane. A year ago I said I would start sharing and learning through LinkedIn. I haven’t done this often, nor purposefully. I have found blogging, Twitter Chats, conference presenting, MeetUps, and using Feedly to aggregate blog posts and Google Alerts powerful ways to learn. I’m unsure whether actively using LinkedIn would create adequate incremental learning value. Having said that, I have recently noticed an increase in posts on topics relevant to me on LinkedIn so am not completely closed to the notion. My number of LinkedIn connections has increased by approximately 25% to 630 in the past year. Mostly others have invited me to connect. I’ve accepted those connections where either I knew the person or felt based on their profile there was some common interest. Socilab generated the visual image of my LinkedIn network shown below (I selected ‘hide names’ so I could share the map, but did look at names on the image to understand the clusters and identify ‘bridges’ and outliers). The map shows data for 499 of my 1st and 2nd degree connections. It includes links between those who are connected to each other. The clusters represent groups of people I know through roles in specific organisations (4 clusters), Learning & Development (L&D) professionals (1 cluster), and a non-work club (1 cluster). 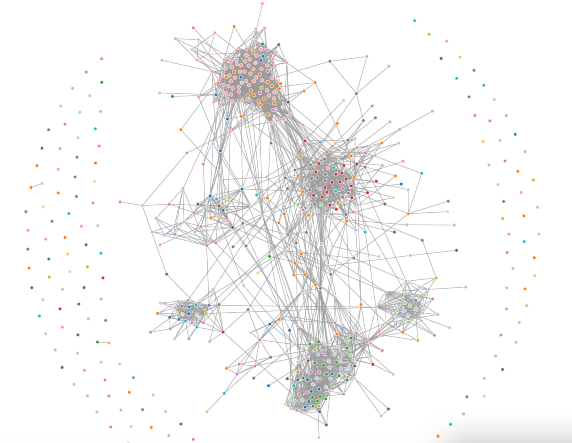 With the exception of the L&D cluster and the club, the bulk of my LinkedIn connections are people I have worked with in the past. As such they are concentrated in a small number of industries and professions, and mostly in Australia. My LinkedIn network is thus relatively ‘closed’ and lacking in diversity. The outliers represent potential diversity opportunities and warrant exploration, as do the bridges between clusters who are people who are potentially good connectors. My ‘real world’ network are those people I spend time with face to face or currently work with in my job. Outside my organisational boundaries the people in my real world network tend to also be in my online network, but are located in, or have visited, Sydney or Melbourne. Within my organisation my network within my business unit is strong, and includes most of the managers and Subject Matter Experts around Australia, who are key stakeholders. It also includes a small group of people in our Indonesian operations, whom we supported to implement technical training in 2014. With the exception of people in Human Resources and Information Systems whom I have worked with on specific initiatives, my network outside of my business unit is small and weak. My network is deepest with those who I have had to collaborate most closely to deliver specific outcomes, and with those who share common interests that are related to my goals. This is a much smaller number than the total size of my network. I am comfortable to have differing degrees of intimacy and connection with those in my network. However, I have not been deliberate in identifying relationships with the most potential to create possibilities and opportunity for both myself and others. I’ve recently been participating in a Working Out Loud Circle. In the Circle Kits and his soon to be published book, John Stepper suggests the use of a relationship list – a short list of people who could support you to achieve a goal and to whom you could contribute. My experience using this approach is that it helps me to deepen key relationships within my network in a genuine and purposeful way. I shall PURPOSEFULLY and CONSCIOUSLY develop my network. My goal is to build a network which accelerates my learning, helps me achieve my goals, and creates opportunities in areas that I am most interested in for myself and those with whom I am connected. I intend to act with a spirit of contribution within my network. Blog post coming soon on my PKM, Networking and maintenance routine. Please reply to this post below to share any tips you have for people seeking to improve their professional network. This entry was posted on February 7, 2015, 6:24 am and is filed under Community, PKM, PLN, SLPP. You can follow any responses to this entry through RSS 2.0. You can leave a response, or trackback from your own site. Hi Annie, researching the tools took the longest (although it was kind of fun) – about 2 hours. It was easy to go down a Rabbit’s Hole as there are a lot of tools out there. MentionMapp in particular is intriguing. Also some of the tools that others had written about using in their blogs are no longer available. Actually using the tools I chose was very quick and easy. Using the tools and writing answers to the 7 questions in Evernote took around an hour. Writing up the blog post also about an hour. I think it was a worthwhile investment. I’ve never considered such a detailed analysis of my networks, both platforms and people. This is encouraging and insightful. Thanks for sharing this. I may take a page from your book (or post from your blog, as it were) and follow suit. Michelle! I’d like to echo Annie’s WOW. I love what you’ve done here – it’s an absolutely impressive analysis of your PLN. So much to like: the intentional nature of your review and analysis, use of tools (which are great to know about), and your attitude towards cultivating your PLN. I also like how you’ve considered your ‘real world’ network as well as your online PLN – I think this is important, especially in the context of considering how your PLN helps you to achieve professional goals (of which many I assume would be work-related). It’s interesting you mention LinkedIn…although I have some crossover with my twitter network, I do often find that scanning LinkedIn I see things that I sometimes miss on twitter because I have fewer connections on LinkedIn – and they’re mostly local rather than global. The other thing about LinkedIn that I find advantageous to, say twitter, is being able to comment more extensively – and thus have more detailed conversations about a post. I have always admired how professionally goal-focused you are with your PLN and blogging and I think you can (and have – and will more!) achieve some amazing things purely through this focused, intentional building and cultivation of your professional PLN. I am a bit less disciplined – and I think for me (now that you’ve got me reflecting on it – thank you : ) I use my PLN as a professional-personal development resource – whilst I connect with a lot of corporate learning people (especially on LinkedIn), I also connect (mainly on twitter) more broadly with people who just intrigue me and incite my curiosity – often these are people I meet through Moocs or tweet chats, and may come from education, marketing, a writing or other creative background. Commenting and conversing on people’s blogs has also been a great way develop deeper relationships. Thanks again Michelle – love your work! Hi Tanya, like you I have many people in my LinkedIn network than my Twitter network and my Twitter network is more global than my LinkedIn network. I shall put in the effort to figure out how to best use LinkedIn. I’m sure there are features that I don’t know about. While it is possible to comment more extensively on LinkedIn or blog posts (which you are very good at doing) I find Twitter more free-flowing and the diversity is stimulating. I think there is space for both being focussed and open to serendipity and following your curiosity in online networks. I hope that being more purposeful and focussed in building my network opens up possibilities and the likelihood of moments of serendipity. One thing that is very clear to me is that online networking has opened up my world and accelerated my professional development beyond anything else I have experienced. Hi Michelle – yes definitely agree with the diversity and more casually conversational aspect of twitter. Twitter is where I find interesting and intriguing people and ideas; the quicker, shorter ‘in-flow’ conversational style it supports is also excellent for sparking conversations (which can then move to a longer form platform, e.g. blog or even emerge as a collaborative project of some sort); and connecting disparate ideas and people. LinkedIn is definitely more ‘mainstream’ – the benefit of this is that there are people on LinkedIn who aren’t (and might never be) on twitter (e.g. people that you might work with, who don’t necessarily have an extensive professional social presence), so I find it useful for connecting with these people. But yes – as a result of being more ‘mainstream’, and an explicitly ‘professional’ platform, sometimes the communication style can be more guarded and less open & more contrived. I have in the past also found some of the LinkedIn groups to be useful for getting answers on specific work related questions (mostly to do with specific elearning tools and tech).